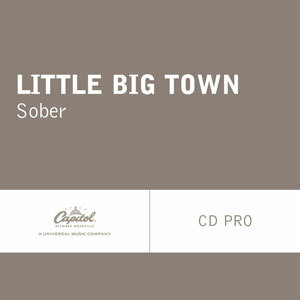 The “Pontoon” phenomenon may have been responsible for putting Little Big Town back on the map in such a big way, but it’s their new single “Sober” that deserves to be a career hit for the talented country quartet. Though recent years have seen Karen Fairchild often tapped as the group’s go-to lead vocalist for single releases, “Sober” finally gives country radio listeners a chance to hear the distinctive vocal force that is Kimberly Schlapman. She interprets the song with poise and subtlety, bringing a sense of genuineness and humanity even to a line as simple as “I love being in love,” while her bandmates join in with their signature heavenly harmonies when the song comes to its chorus. “Sober” is one of those rare mainstream country releases in which everyone involved brings their A-game. Lindsey, Rose and McKenna write a gorgeous song, and Little Big Town proves to be the ideal act to bring it to full realization. Likewise, Jay Joyce’s elegantly restrained mandolin-driven production impresses in creativity, taste, and in overall effectiveness in supporting the song and performance without getting in the way. Here’s hoping that country radio can still find a place for such a delicately polished gem as this. It’s a high-water mark for an act whose catalog is already more than respectable. Little Big Town has rarely if ever sounded better. Agree! Great song! Radio needs to play it for us! One of the songs I push repeat on my car CD player, so I can hear it again. Definitely special. …sounds like country listeners are finally waking up in bigger numbers to the abba-like qualities of little big town’s hits. the vocals have always been great, but lately the four seem to have found the winning formula for sustainable radio success. “sober” is another fine song by them. it doesn’t sound as if their winning streak is about to end soon. good job. But still only my 2nd favorite on the album (“Leavin’ In Your Eyes” being my favorite). I’m just hoping that the performance of their last single, “Your Side of the Bed,” doesn’t mean that radio has already forgotten this amazingly talented group. This needs to be a hit. It would have been in the past. I share the same concern as Chad. “Sober” is an amazing song and single. It should have been the 2nd single, or at least the 3rd single. I don’t know why they waited so long to release it, and it hasn’t taken off at radio…yet? I was so thrilled when I found out they were releasing this song. I must admit that Karen is my favorite and I absolutely love singing along with her, but Kim has such a beautiful voice! I’ve been dying for them to release a single she sings lead on. Unfortunately, with the way country radio is at the moment, I’m seriously afraid this beaustiful song might end up with the same fate as some of their previous singles. And that’s a terrible shame because they are truly the BEST band anywhere. They’re recent success has brought me to tears of joy several times in the last few years. I couldn’t be any prouder to be a Townie! Yeah, this song and my finally getting around to listening to “The Road to Here” gave me an epiphany about LBT. I had always thought I didn’t like their work, but it just turns out that I dislike every single other song that they have ever released as a single. So after verrrryyy slowly climbing into the top 40 at country radio and stalling there for a bit, this is now falling fast. I don’t get it. This is a glorious, sumptuous single. I know their last single didn’t do well, but the two songs before it did really well. Why did country radio suddenly turn its back on LBT and this song in particular?!? !